1954. In the bustling African port city of Accra, a burgeoning outpost of the British Empire, young men from the surrounding area find work in a variety of occupations. This is a place of contradictions, symbolized by two parades through the downtown streets, one by the daughters of Jesus, the other by local prostitutes. Some of the young men travel out to the countryside to take part in extraordinary rituals in which they dress up, fall into a trance and perform animal sacrifices. After the ceremony, they return to the city and the normal routine of their lives. 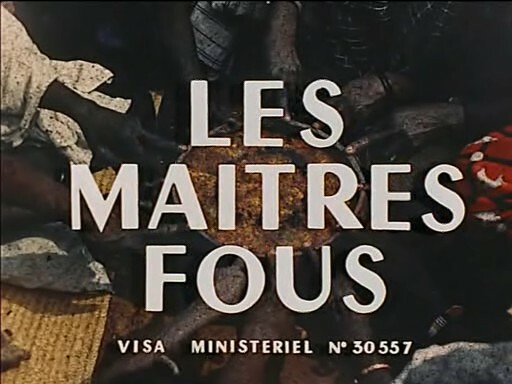 Les Maitres fous is about a ceremony performed for the camera by the Hauka, a religious sect that was widespread in West Africa from the 1920s to the 1950s. There were at least 30,000 practicing in the Ghaniain city of Accra in 1954 when Jean Rouch was asked by a small group to film their annual ceremony. During the ritual, which took place on a remote site a few hours drive from the city, the Hauka went into a trance and become possessed with the spirits of their colonial masters, imitating and mocking their behaviour in a grotesque manner. They are also shown speaking in tongues, frothing at the mouth, handling fire, reaching into boiling water without being burned, and eating a dog. The effect is both fascinating and unsettling. Indeed, the colonial authorities were perturbed enough by the scenes portrayed that they banned the film in 1955 and it remains controversial to this day. Jean Rouch was one of the founders of cinema vérité and a pioneering ethnographer. He was devoted to Africa and spent most of his five decades as a filmmaker documenting the lives of its peoples. Avoiding sentimentality or condescension, he recorded what he saw; always respecting the veracity of the image in relation to the reality filmed and genuinely concerned with the fair treatment of his subjects. Much of Les Maitres fous’s distinctive appeal comes from the juxtaposition between Rouch’s laid-back, objective narration and the sensational imagery of what we are watching. In his commentary he asserts what has become the standard interpretation of the ritual – that it is a parody of the colonial occupation, with the Hauka focusing their disdain for their white masters into exaggerated appropriations of their masters’ ceremonial rites and dress and manners. Some anthropologists have criticised this analysis, arguing that the imitation in the ceremony is a way for the indigenous people to gain rights and status in the colonial society; their adoption of the European customs not so much a form of resistance, more a way to be respected by the Europeans. As the Hauka movement died out soon after the film was shot, we will probably never know for sure the precise meaning of the witnessed ritual. Whatever its true significance, the scenes captured in Les Maitres fous hold a visceral power that has proved enduringly influential on Western culture. Jean Genet wrote his play The Blacks (1959) in which blacks assume the role of masters, after seeing Rouch’s film, and Peter Brook’s staging of Peter Weiss’s play Marat/Sade (1964) was influenced by the theatricality and spontaneous language of Hauka possession. The ritual’s very ambiguity gives it a universality beyond its immediate time and place. Even the title is open for interpretation – are the Africans the masters of madness in the way they behave or is it the British and their ceremonial displays who are the mad ones? Rouch encourages such speculation as he cuts between a parade ground and the Hauka mimicking the rigid gestures of the Governor and his troops. Les Maitres fous has been called the “greatest anti-colonialist movie ever made,” yet when it was first shown in Paris, there were some who asked that it be destroyed fearing that it confirmed every stereotype held by Westerners about “savages.” Yet however it might be interpreted, the desire of the powerless to break free and overcome their situation through shamanistic ritual is common to all civilizations. As Jean Rouch himself described the Hauka ceremony: “This violent game is only the reflection of our civilization."